Imagine: you wake up on a bed in an expensive, outdated suit. You don't know where you are. You're confused. Around you is a "tingling and static dark." You're queasy. You're restless. You reach out into "the treacherous thick air" to find a light switch. Light blooms. You find yourself "in a motel room, shoddy and dim," with "a glass screen of some kind on a black platform" in front of you. You think you've been kidnapped. Russians? Maybe you've suffered a head injury. The last thing you remember is watching the desert explode in a "great and terrible flower . . . [a] sear of lightness lifting up the sky" in 1945. Only now it's 2003, and you are still J. Robert Oppenheimer, father of the atom bomb, displaced in time. Within hours you will learn that your fellow scientists, Enrico Fermi and Leo Szilard, have also been displaced, waking up in a gutter, and "beneath a table that smelled of french fries and disinfectant, in a cafeteria at the University of Chicago," respectively. It was from this moment, fourteen pages into Lydia Millet's Oh Pure and Radiant Heart , that I began to suspect that I was falling in love. It was the description of the blast that did it. The great terrible flower. The sky being lifted up in a sear of light. Simple, elegant sentences, falling into my mind the same way an attraction does, the way they smile, with a hint of teeth, perhaps, or with those dimples, or lopsided. It is a tiny mannerism unique to the individual and it gives you an awareness of the person at a micro level, an intimate level. As with people, this is how good prose works. You are drawn in at the beginning by tiny things, a passage, a word, the awareness that you and the book are growing in intimacy. At your own pace, you are drawn into the book as a whole and, once within, like any relationship, you either grow apart or closer. Your personality matters. Who you are. What you bring to the novel. Reading is not a passive act. I would not date a racist. Likewise, I would not read a book promoting racism. It doesn't matter how attractive either are, how beautiful in form or words, it just won't happen. 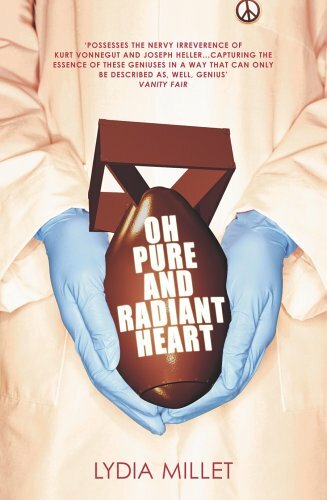 It may be that Lydia Millet's Oh Pure and Radiant Heart is not your kind of novel from the outset. It may not strike you as intimately as it did me. We love differently, naturally, though at times we do not wish to celebrate this diversity. Millet's novel is a large (489 pages) and socially concerned book and there are people who will not be attracted to a novel of this size and content, and that is fine. Someone rapped on Ann's window: a cop. —This is a no-parking zone, ma'am, he said, when she rolled down the glass. —Fine, but you just want to pull up and around the corner there. You see? Right there, across from the mailbox. —Sure. OK. I'll pull up. —And you sir, you been wearing your seatbelt? The cop slapped the roof of the car and she pulled around the corner. The result of Millet's blending is a sequential, textual collage. The viewpoint is fragmented between Oppenheimer, Ann, and her husband, Ben, and the different perspectives often overlap, playing off each other. The collage of Oh Pure and Radiant Heart is not one that can be appreciated with an initial glance, as a physical collage can be, but rather is one that layers as the reader progresses through the novel, each event and image built up as Millet heads towards her finale. The risk that Oh Pure and Radiant Heart runs is that it will be read as a didactic work, one that aims to educate and preach—and to a degree, it is. You will not, by the end of the novel, mistake Millet's position on the subject of atomic weapons, but this, in itself, is not a problem. It is not a bad thing to have an opinion (and not a bad thing to disagree with it, if you do), and in any case to focus only on the opinion would be to miss the fact that Millet is an author who is capable of interweaving her politics with superb characterisation, humour, tension, and tragedy. I am not, in any fashion, an expert on any of the three scientists, but within the context of the novel, Millet's portrayal of each is more than believable. There is the chain smoking, dry-witted and detached Oppenheimer; the quiet, unobtrusive Enrico Fermi, whose arrival in 2003 triggers depression; and the slovenly, unstoppable Leo Szilard, who embraces the world around him with a dazzling ease, throwing himself onto the information superhighway without the sense of loss that the others display early on. The characters who populate the novel around the three scientists, such as Ann and Ben, as well as assorted hippies and Christians, are not as interesting, however. Ann and Ben's long mediations on life, love, and their purpose in the world are, at times, tedious, and the characters within the hippie and Christian camps are mostly uninteresting, acting only to serve Millet's plot. The lead hippie, Larry, for example, is so conveniently rich that he can provide anything the three scientists and Ann and Ben need. The book's other flaw is that, as the cast grows in the last quarter, as Szilard organises a peace rally, the characterisation of the scientists slips. The quiet, personal, idiosyncratic moments that drew you in fade next to Millet's need to make a point about life in the twenty-first century. It is not that by the end that Millet has forsaken intimacy, or that Oh Pure and Radiant Heart becomes a speech about what is wrong with the world—neither of these things happen. But the tightly controlled, perfect balance between her cast and social concerns slips. The cast becomes too big, the concerns too large to have any kind of feasible answer, much less one that allows her to offer closure to the scientists and those around them. With all this to bring together, in its closing pages Oh Pure and Radiant Heart becomes slightly messy, though it remains satisfactory even as it does. Still, occasionally love is messy, and despite its flaws, Millet's book is passionate, beautiful, and unique. I am in love, yes, and I am unashamed. Ben Peek is a Sydney based author. He has published fiction, poetry, articles and reviews. His fiction is currently appearing in the anthologies Leviathan Four: Cities , The Year's Best Australian Science Fiction and Fantasy , Forever Shores , and Agog! Smashing Stories . He also has fiction in the online zines Shadowed Realms and Ticonderoga Online , as well as the dead tree zines Full Unit Hookup and Potato Monkey . His dystopian novel, Black Sheep , will be published this year by Prime Books. Ben Peek is a Sydney-based author. He has sold fiction to the anthologies Leviathan Four: Cities , The Year's Best Australian Science Fiction and Fantasy , Forever Shores , Polyphony , and Agog! Ripping Reads . He also has sold fiction to the dead-tree magazines Fantasy Magazine and Aurealis and the ’zines Full Unit Hookup and Potato Monkey . His dystopian novel, Black Sheep , will be published at the end of the year by Prime Books.